Last week on a rather cold March afternoon, I was honoured to be invited to record a piece for international television on the achievements and legacy of Sir Winston Churchill. Boon one of our tours, perhaps the Churchill tour and find out why we are in demand! For the third year in a row. Ye Olde England Tours has been recognised by Trip Advisor… this time with the 2017 Certificate of Excellence! Thank-you to all our guests for helping us make dreams come true, yours and ours! Ye Olde England Tours now has our very own YouTube Channel. Here we hope to post short videos featuring some of the big sights and hidden locations around London and the UK. Subscribe to keep up to date! You can read more about our team here. Spring is nearly here, and it is one of the best times to visit London and explore England. There are comparatively fewer tourists even at the hotspots, recently on a tour we visited Portsmouth Historic Dockyard, and the site manager said there were only 200-300 people there all day when in peak season there could be easily over 5,000. This week sees the beginning of a year long special Shakespeare celebration and if you like all things Shakespeare or simply want to visit a peaceful and beautiful small English town that just happens to be the home of the greatest literary writer then why not visit Stratford Upon Avon. This week I had the pleasure of taking Wendy from South Africa on a number of tours. We explored London, and we visited the tremendous Warwick Castle with its scary dungeons, birds of prey and views of several counties from the top of the tower. However nowhere was better than Stratford Upon Avon. The weather was warm and sunny even on the last day of April, so we took our time walking around this pretty town. There are 5 Shakespeare-related houses in and around Stratford Upon Avon, each one different in their own way and each with beautiful old traditional gardens full of formal flower beds, roses and expansive lawns. One of the pleasures of visiting Stratford Upon Avon is simply walking down the pretty little streets, full of interesting old shops and cafes which as Wendy and I can confirm, served the most delicious goods. As well as the Shakespearean houses there is the original period home of John Harvard, founder of Harvard University in the USA and if you can tear yourself away from the beautiful streets and buildings then it’s always worth the effort to walk along the picturesque river through the park as the swans and boats go by until you reach Trinity Church which is, of course, the final resting place of William Shakespeare. When we visited there this week, the inside of the church was festooned with floral bouquets and wreaths for our favourite writer but of course, the church is beautiful in its own right. If you’re in England now or planning a winter visit to the United Kingdom then why not have a seasonal day out with us. 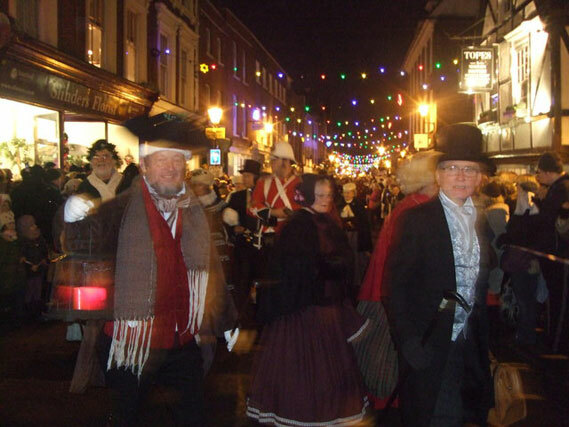 There are numerous and memorable Christmas Markets throughout the South East of England with arts and crafts from around the U.K. and Europe. Many of these are in beautiful old market towns and cities or even in some of the historical attractions that we visit throughout the year. For something really seasonal, why not have a day tour to Windsor old town and, of course, see Windsor Castle too. Another very good idea is to visit Rochester in Kent, just east of London. Most of our modern Christmas traditions come from the Victorians and one man, in particular, Charles Dickens. You can’t have Christmas without the tales of Scrooge and The Christmas Carol. Rochester has many Charles Dickens related sights as well as a castle and a beautiful Cathedral. Visit the main shopping street and you’ll think you stepped back in time.